Motorcycling isn’t just about the open road or the wind in your face. Ok maybe it is, but to truly enjoy those things you have to make sure you are comfortable for long miles in the saddle. You wouldn’t want a numb bum! We ride with Corbin saddles on all of our bikes because they are the best in the world. Corbin gets the shape right, uses resilient foam that doesn’t collapse and lets you ride all day. They are quality built right here in the USA and Corbin stands by it’s products. 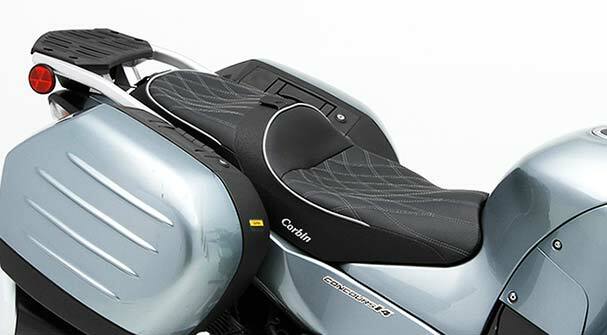 This is the new Corbin saddle for the Kawasaki Concours 14 that I worked with Mike Corbin that offers a front driver backrest slot. It really requires the Heli Horizon ST handlebar to make if work – and work it does.